Last weekend I was pleased to launch CllrTweeps. 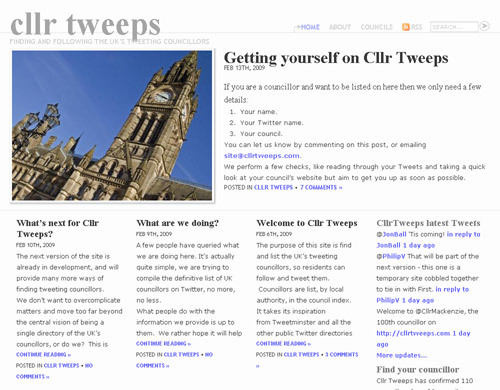 The new site, inspired by TweetMinster, aims to list every local councillor in the UK who is on Twitter. After our first week online, we have already tracked down and verified the first 100 councillors using the service. The first version of the site is run from a very basic WordPress template. As great as WordPress is, it isn’t really cut out for this kind of site. Luckily, we’re already working hard on version 2, which will bring a more organised directory, cleaner look, and provide us with a good basis to add in more feature such as post code search and mapping. You can keep track of the developments on the CllrTweeps blog or here in my new CllrTweeps category. A big thanks must go out to James Cousins (twitter.com/jamescousins) who has put in pretty much all the leg work for the launch of the site. Thanks also goes out to Liz Azyan for helping to identify the councillors and Hywel Vaughan who is working with us to create the branding for version 2. While we’re busy working on the next version, if you know of a councillor on Twitter please point them in our direction! 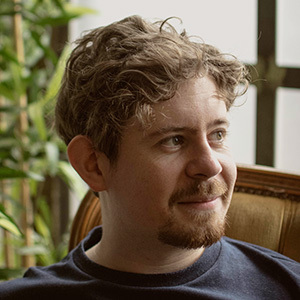 I am a councillor who twitters – I’m the Lib Dem Exec Member for Children’s Services in Southwark (London Borough of). Was directed to your website, and see the sentence about directing councillors who twitter here, but it doesn’t tell them what to do when they get here! The link to click to register on the directory isn’t apparent. Help! Is you councillor tweeps site still operating….the link doesn’t seem to work?